Kenneth Eugene Gillihan, 71, passed away April 15, 2017, at his home in Bucyrus, KS. Funeral Service will be 3:00 pm Friday, April 21, 2017 at Bruce Funeral Home, Gardner, KS, 913-856-7111. Visitation will begin at 1:00 pm Friday, before the service at the funeral home. Cremation will follow the service. Memorial Contributions may be given to Saint Jude Children’s Hospital. Ken was born November 19, 1945 in Gardner to Mary Rose (Loftus) and Hobart Robert Gillihan. He was a 1964 graduate of Edgerton High School. He was a Vietnam veteran and served for two years in the U. S. Army. Ken married Kathie Sue Bowman on August 16, 1974 in Prairie Village, KS. They lived in De Soto, Overland Park and then moved to Bucyrus in 1986. He worked for General Motors in KCKS as an assembly auto worker for 31 years, retiring in 2000. Ken also worked for the Kansas Dept. of Wildlife. He was a member of the VFW Gardner Post 11234 and the American Legion Post 0250. Ken’s past-times included his vegetable gardens, helping his neighbors, tending to his cows, assisting his son-in-law Travis on his farm and his annual fishing trips with his son-in-law Patrick. He also enjoyed traveling with his wife. Ken was an avid hunter and fisherman. He loved spending time with his family, especially his grandsons, and he will be dearly missed. He was preceded in death by his parents and siblings Donnie, Paul, Mary Jo, John and Patty. 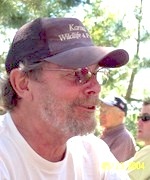 Ken is survived by his wife Kathie, of the home; daughters Heather Lynn Joyce and husband Patrick of Lee’s Summit, MO and Megan Kay Henry and husband Travis of Lathrop, MO; grandchildren Henry, Tucker, Carter, Kenneth Logan, and Hayden; siblings Gerry Sue Brite and Rick Gillihan, both of Gardner.